Two ships launch, but only one can come home with the prize - and no one suspects what they'll find when they get out there. On June 30, 1908, an object fell from the sky, releasing more energy than a thousand Hiroshima bombs. A Siberian forest was flattened, but the strike left no significant crater. The anomaly came to be known as the Tunguska Event, and scientists have never agreed whether it was the largest meteor strike in recorded history - or something else. Alien artifacts have been uncovered since the 1908 event, and a new star drive is discovered. 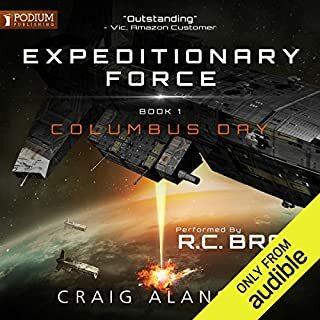 When another larger artifact is detected orbiting Jupiter, both NASA and the Russian Federal Space Agency are determined to beat all rivals to the next treasure trove of alien tech. 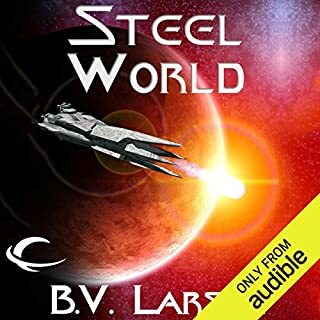 ©2014 B. V. Larson (P)2015 Audible Inc.
What did you love best about Starfire? This type of story was different as it felt like a realistic play of events if something like this were to happen. Scrambling of governments, rushing ahead of the others, risking all in the process. 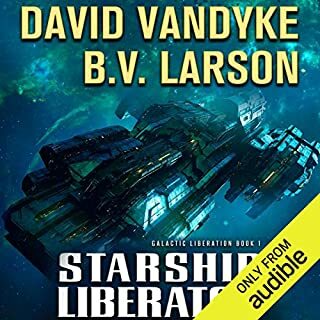 It wasn't as flashy as some of the other scifi stories I've listened too but it felt real and sort of left a dark feeling on me. Not in a bad way, just made me wonder if something like this would play out in real life if this ever happened. What other book might you compare Starfire to and why? I'd like to sort of compare this to the movie contact. But not completely. Its a story about choices and decisions. So for me, it really stands out on its own. There is a part towards the middle in which scientists face a decision that will affect humanity greatly. When I got to this part, I stopped and wondered what I would do. Even going out and asking others opinions. It was odd, I couldn't even think of a time in which I saw, read, or heard of anything like this before. It really made me think. I'm a huge fan of this writer. Big fan. This story was different and was unique all in its own way. Each character was well created and explained. No one is safe to survive this story as I was shocked a few times. Many times I felt conflicted on what happened. Out of all scifi stores I've come across, this one really left a lasting feeling of how decisions could change everything about humanity. I can't say much without ruining it for anyone reading this but I will say, if you like scifi with a bit of a realistic spin to it, and maybe a bit of cloak and dagger this might be a good one for you. Don't expect space battles or anything like that but it stands alone as a good scifi story. This one is really good. I recommend it. 'Starfire' and John Sandford's 'Saturn Run' are about the same thing. Each is propelled by a a cleverly different idea about Saturn and aliens. The difference is that Sanford is apparently not just a good craftsman, but a great one. Great? If you didn't believe it before, listen to, as I just did, the two books back-to-back. Unwittingly, Sandford gives Larson and us a writing lesson. Take for example Larson's chameleon characters who develop entirely new skill sets whenever the plot needs them. It's as if a stripper abruptly becomes a graduate engineer, a drunken sailor morphs inexplicably into a naval architect and on and on... Hmmm... if I could only awake tomorrow as a world-class pianist... Sigh. It is not the improbability of Larson's science that ruins this book, but the ghastly leaps of character development (or lack of). Yep, I listened to Edoardo Ballerina try to make sense of the characters, but his impressive talent couldn't turn straw into anything glimmering. Pass on this one and buy 'Saturn Run'. 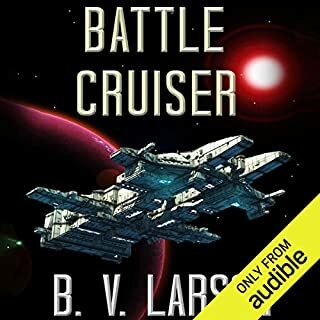 This book seems like a change for Mr Larson in that it is not military sci fi so there are no armies, battles or starships bristling with weapons (although it is hard to not think that that will change in the sequels). Instead we have both the US and Russian governments trying to get alien technology that was left on Earth about 100 years ago working. Both countries are after technology advances that they believe can be reverse engineered (or gotten in some other mysterious way) from the technology, but the sending of a signal from one of these “artifacts” back to its point of origin generates a race to get to the target spot and find what is there. This book seems to be a bit unusual in the way the story is presented. While first contact books are fairly common in science fiction, few that I have read have results as horrifyingly bad as in this book. In addition, the characters themselves are a very mixed bunch in terms of the types they represent. While we do have a number of normal, likable people we also have more than just a few characters who are not only unlikable, but actually scary in the sense that it is difficult not to worry about people like these having responsible positions in any large organization or, in this case, government. This is clearly the first book in a new series as little is resolved by the end of the book, but Mr Larson has given us a fairly well developed sense of who the characters are, what their strengths and weaknesses are and we begin to see the resolving personal relations between them. While I found the writing quite good (as is to be expected from Mr Larson) and the characters well formed and interesting I am not sure I will buy the sequel to this book. The story, while interesting, is not compelling and although it is easy to see what the next book will bring, it was difficult for me to believe that any reasonably intelligent group of people could, or would, make the decisions made by the characters in this book. On the whole, not one of my favorite Larson books. Good, in my opinion, but not great. Perhaps the sequel will be better. The book is very well narrated by Mr Ballerini. Satisfying in so many ways! 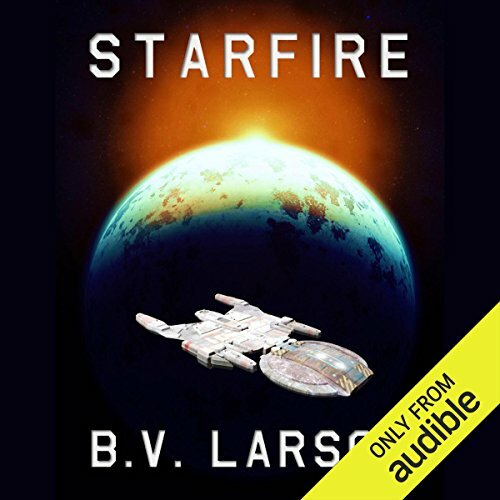 Where does Starfire rank among all the audiobooks you’ve listened to so far? A tough question, given the volume of audiobooks this reviewer has enjoyed over the years. That said, it warrants a thoughtful response. I would rate it in the top 25 %, and towards the top of that category. It is complicated enough, and with enough twists and authentic characters that it grabs and retains the listener throughout. The interactions between the Russian and American crews are fascinating, and the ongoing lack of trust, and resulting tensions, was highly entertaining. I was trying to recall if I had or not, and it appears this was my first exposure, at least in recent times. He definitely owned the characters, was consistent with his accents and tone, and overall was extraordinary. He has moved into my list of top performers just with this one offering. Nothing extreme, but certainly chuckled a few times, and was shocked by some of the "events" as they unfolded. Kudos to the author to keep the story arc fresh and always interesting. Highly recommended for many reasons! If you could sum up Starfire in three words, what would they be? I would compare Daniel Suarez's Influx to Starfire up to a point (without giving away too much). But there are elements from other recent sci-fi novels that peek through here as well. I am used to Mark Boyett reading BV Larson books. For the Star Force and Undying Mercenaries series, Boyett made sense. Those series have a lot of action to parse through quickly. Ballerini tends to slow things down a bit, which I think is appropriate for this book. His range is very good, as he portrays female characters very well, and handles a good Russian accent. I've only listened to one book done by Ballerini and I think he's definitely up there with my favorite narrators. Overall, a great book and definitely nothing I expected from Larson. I love Star Force and Undying Mercenaries, so to be honest I was expecting something along those line here. But I was pleasantly surprised to have read something altogether different. I read anything by BV Larson, i dig his style. This was a decent book. Id say the first 2 thirds of the story werent like anything by BV that ive read before, and i liked it. Then in the end classic BV came out. If you like the Star Force series, and a little espionage, read this. I made it over six hours and the first three hours seemed a little promising. It just got to the point where I did not care. The mystery that wasn't a mystery was being dragged out too long and to compensate for a dragged out plot, Larson would shoot somebody about every five minutes,usually in the head. There was a lot of politics and conspiracy theories, with the reader not knowing who was who. Even the characters did not know who was who. It was too complicated for my pea brain. It also seemed to be encouraging the thought that all of the United States' inventions came from an alien artifact. This did not help to endure me to the story line. Larson is not Dan Brown. There are a number of favored locations often involved in contemporary science fiction when the main theme is aliens visiting planet earth. 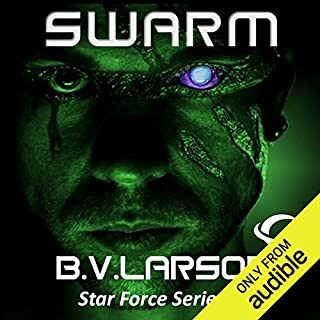 Two such favored locations, Area 51 and Tunguska, Russia are both involved in this stand alone sci-fi tale that comes from prolific story teller B. V. Larson. With one location being in Russia and the other in the US, these two cold war rivals once again find themselves in a high profile race, this time trying to be the first to get their hands on advanced alien technology. 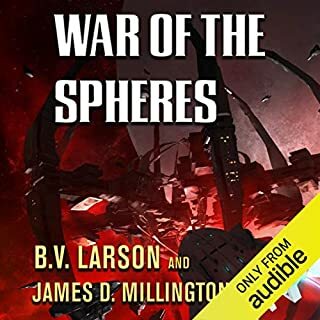 Despite this being a race between rivals, this book actually starts out rather slowly with a vast array of characters being involved in a series of seemingly unconnected events; however, Larson eventually weaves all of the various threads together. It is when the characters converge together and begin to interact that the story really takes off and finishes on a high note that leaves you wanting more. In order to avoid spoiling any of this story I will merely state that for a lot of this book I was not all that into some of threads and the characters themselves. The disconnected nature of the story telling had me convinced that I would be glad this was a stand alone book and not a series, but by the time it was over I was disappointed that there is no sequel to move on to. If this was the start of a series I would have surely have picked up book two immediately to find out what the consequences were to the actions taken in the latter third of this book. Perhaps some day Larson will decide to tell that tale and if he does I will certainly be eager to hear it. Edoardo Ballerini narrates this one and does a decent job with all the voices and accents. One of Larson's Best Works. I've enjoyed a large number of B. V. Larson's works; but typically think of them as light reading/ listening material. Not material with extremely deep plots; just a guilty pleasure to listen to while driving or relaxing. Starfire is a break from the simple plots seeded with tons of sarcastic humor. This book gets deep into intrigue, mystery and thriller territory; with a science fiction backdrop. I don't like to include spoilers in my reviews; so I won't stray into the plot, beyond mentioning the fact that it happily ends with an obvious lead-in to a future sequel / series of books. I can't wait for the next one to be released. Stupid, petty humans won't work together. This has a more thoughtful ending than a happy one. It doesn't end with heroes winning and bad guys done for. Lots of good people die and some questionable ones remain. No matter the century, politician and politics remain the same. Will humans ever act as Earthans rather than tiny nationals? The story starts out as a spy/mystery/chase story, then evolves into sci-fi. The Russians and Americans are at it again and no one will be spared in this race to hopefully find aliens and, even more important, their tech. It is all quite believable, except perhaps this hair-brained dash off to Europa in a ship they can't fly. And leaving First Contact to a sociopath. Ballerini does a fine job with the voices, male and female, and the Russian accents. This is another great Larson book but more unsettling and contemplative than his other works. This is an easy read, with some clever ideas and believable characters. The narrator is exceptionally good, with a wide variety of voices to add to the mix. I thoroughly enjoyed it. This is laughably implausible, the history and the science are at best iffy. Silly-fiction rather than science-fiction. Slow and lumbering. I finished because I'd started it but definitely didn't keep my interest like his other books. It's worth a listen and I will get the follow up book. mostly a predictable story. nothing to write home about. the reader nade it entertaining. probably will look for the sequel, if only to see what happens next. The story as a concept is good but I just found the story a bit thin and lacking punch. I'm no expert and don't know exactly how it could have been improved but in my view it lakes the impact.